If you’re responsible for helping people continuously learn and stay up to date, you already know that formal training courses are not enough. They’re great for getting to a baseline level, but even the best courses and resources go out of date. Continuous learning means just that: Finding relevant content from different sources, continuously. But that’s not easy. There’s too much content for any human to consume, even in niche areas. Say you’re interested in Artificial Intelligence. Nearly 11,000 articles were published on it in the last 30 days alone. If you spent 30 seconds on each of them that’s about 90 hours, times the number of people in your organisation doing their own searching. And every time you read an article only to discover it’s not relevant, that’s wasted time. We need trusted guides to source and share the best quality from the slew of content out there. That’s where Content Curation becomes a critical skill for learning professionals. Content Curation is the act of continuously finding, filtering, making sense of and sharing relevant content. Relevance is in the eye of the beholder of course – we’ll get to that below. So how do you do it in learning? Not by telling your team that they can just Google it. You need to provide a more personalised service, powered by AI. Like any learning initiative, curation works best when you focus on a specific audience. This is likely to be people with common roles and objectives: teams and groups. So it may be the front line sales team, everyone working on a specific client account, all line managers, or developers working on a specific project. Tip: Think roles and groups hungry for insights. It’s likely to be groups who you’ve designed or implemented learning solutions for before and who naturally seek external insights. Leaders and sales teams are a great start point. 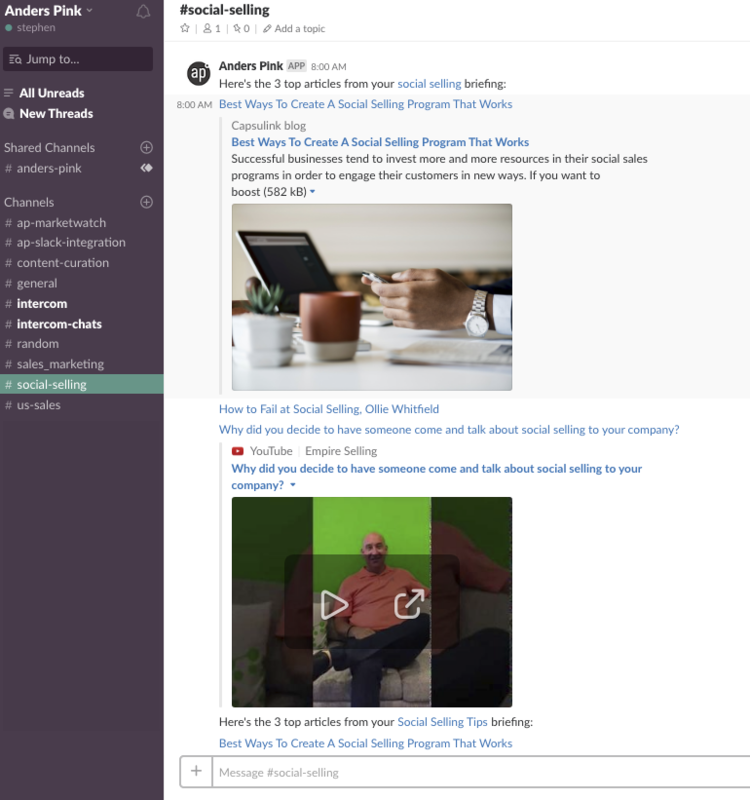 You’re curating for a purpose: to help teams stay informed. So you need to know what being informed means for them. To do that, walk through their daily activities and uncover where timely, relevant content would help in their workflow. To use a phrase from Jane Hart: be a content concierge, and get them what they want. What type of content would help you the most when tracking a particular sector, prospect or client? How important is it to actively monitor industry/sector trends? Which trends/sectors? How important is it to actively monitor competitors? Which ones? Where do you want to get it, and how often? …and so on, to uncover the appetite for constantly updating information for this group. Tip: Follow on from formal. If you’ve been working on learning programmes or solutions for this audience, use your insights from scoping these programmes to help identify their ongoing needs. If you recently implemented a formal course on social selling, it’s a good bet that ongoing tips and best practice on social selling is going to be useful. How do you currently stay on top of this information? Do you subscribe to industry newsletters? Follow blogs? Look at key sites and publications? Which ones? Do you follow industry influencers on LinkedIn or Twitter? Who? How much time do you currently spend searching and reading this type of content? Do you feel you get too much information, not enough, the right amount? Can you give me some examples of the types of content that you’ve acted on, learned from, used to help achieve a goal? 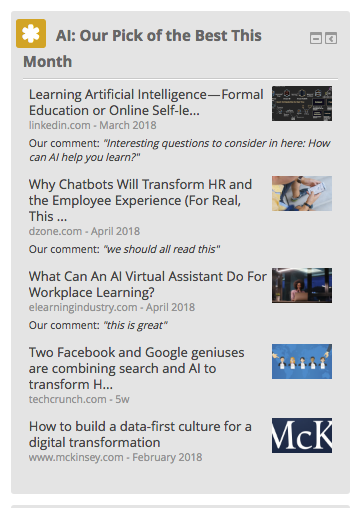 Your killer curation concierge question: If I could put all this together in one place for you and keep it updated every day, would that help? You can ask a section of team members these questions to get a sense of what current behaviour is in terms of seeking out relevant content, what the popular sources are, and where the real need is. You’re likely to find a situation where there’s too much irrelevant content, coming through disparate sources. Your role as a content curator is to make sure that quality and relevance of content increases, but time and effort to find that content decreases. That delivers a productivity gain by default. And timely, relevant content comes at close to zero cost if you’re using a good set of tools to surface it, and sourcing from the huge amount of public domain content out there. In most organisations and teams you’ll find people are natural seekers of new information, to use Harold Jarche’s term (or JK Rowling’s, if you’re more of a Quidditch fan). They look outside the organisation. They read industry blog posts. They’re active on social networks, following influencers on Twitter and LinkedIn. They may regularly share links to articles with other members of the team. They’re well connected and naturally curious. They might also be the more senior members of the team, or people recognised internally as Subject Matter Experts, but one doesn’t necessarily follow the other. Finding these seekers can help you immensely in scaling curation, as they’re effectively doing it for themselves. You want them to take on the seek/sense/share activities we’ll come to later. Tip: Find them on Twitter! They’ll be the ones with the most comprehensive answer to your questions on sources and time spent reviewing and sharing content. People will recommend them as the ones in the know. You’ll find them on Twitter and LinkedIn already sharing insights about your business. Now it’s time to put those together and create your curation sources. Think of this as the long list of aggregated content from multiple sources. Aggregation is not curation. We’re big fans of the seek / sense / share model and at this stage, we’re seeking out content from this combined set of sources. Next we’ll you’ll need to sift and filter to identify the most relevant content, make sense of it and share it. So now it’s time to work with your seekers/SMEs to pull all of the information sources together. But that’s a lot of work, and you’d need to do it every day to keep it up to date. Curation at scale needs more automated solutions. Filter all of your sources to only display content when it features your key terms – so you only see content from key Twitter influencers when it’s about Leadership for example. Here’s one on Leadership for example. It takes content from keywords on leadership, filtered to 30 top leadership sites, blogs and sources, updating every few hours. You can use algorithms to filter content to a great baseline. But algorithms aggregate – only humans can curate. So now it’s time to add your insights. This means way more than just flicking on a link to time-pressed teams. This is about adding commentary, context and insights, removing irrelevant content, so only the highest quality makes it through. As Robin Good says, good curators are trusted guides. You need to be continually uncovering new content, and discerning about what you share. Add a comment to give context, e.g. “Last month we were all talking about how to reduce the sales cycle, this article talks about specific ways of doing it in our industry”. Tip: Get your Seekers to comment. Your Seekers/SMEs are going to be the most natural sense-makers given their domain expertise, and their authority with their colleagues, so you want encourage them to lead on this. It’s good for their profile too, and L&D can support with some insights on stats and engagement. You want your curated content to show up where your audience are already in the workflow. Tip: Automate the integration: If you need to remember to copy and paste links into a CRM or Slack channel every day, there’s just a slim chance you might forget. APIs and plugins don’t forget. They make it simple to push content from curation platforms like ours into other channels every few hours. Hook them up, make it easy on yourself. Curation is about conversations, not just broadcasting. You want to build a community around curated content, where the whole team is making sense of the content, and sharing their thoughts. Tip: Encourage everyone. While you might see that it’s mainly SMEs, seekers and you driving the discussion, make sure you use tools (like Anders Pink) that enable anyone to take part in the discussion, and encourage people by asking them for their thoughts. Content Curation is a long and winding road, as Jay Baer put it. But it’s made up of lots of short sprints. You want to encourage good practice and habits with your internal teams. Think short check-ins on what’s new every day, not catch up sessions at the end of the month, when most of it is old news. If we all invest 10 minutes a day to keep on top of what’s trending, it can make an enormous difference. If you can convince the whole team to do this, you’re building collective intelligence – a team looking out for trends, and looking out for each other, some factors that are known to contribute to high performance. Tip: Lead by example. Curate content on learning trends for yourself first and commit to 10 minutes a day. All of us in learning have trends we need to keep on top of. Here’s an example of articles on elearning from 40 top blogs. Worth 10 minutes a day to scan this for tips and trends? Is it saving time and helping them learn in the workflow? What are people most engaged with? Do we need more of / less of any type of content? Final tip: Pick a team and try it! The great thing about content curation for learning is that it’s very low cost to pilot (if you’re using tools to reduce the seeking and sharing effort). Compared to the cost of building a course, and the time it takes from an SME, it’s close to zero. 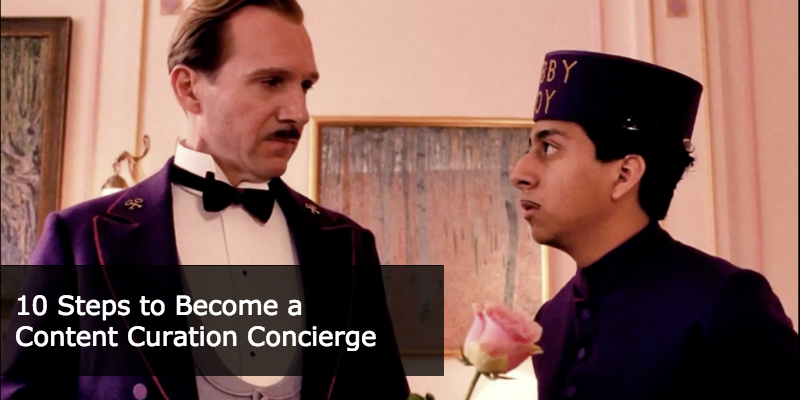 Ready to put on that Content Curation Concierge Cap? All you need is a pilot team: Sales, product knowledge, marketing, compliance, services, R&D – these are all good candidates. Help them in a different way from creating training. Bring them fresh content every day. You add value, they stay smart.